Our day started out early with a wake-up call at 4:15 am. For breakfast, we had some tangerines and bananas bought from some locals the previous night. Our waterproof backpacks were stuffed with snacks, climbing shoes, camera gear, and water. Juuso's 90L had our two Kokopelli packrafts and paddles. 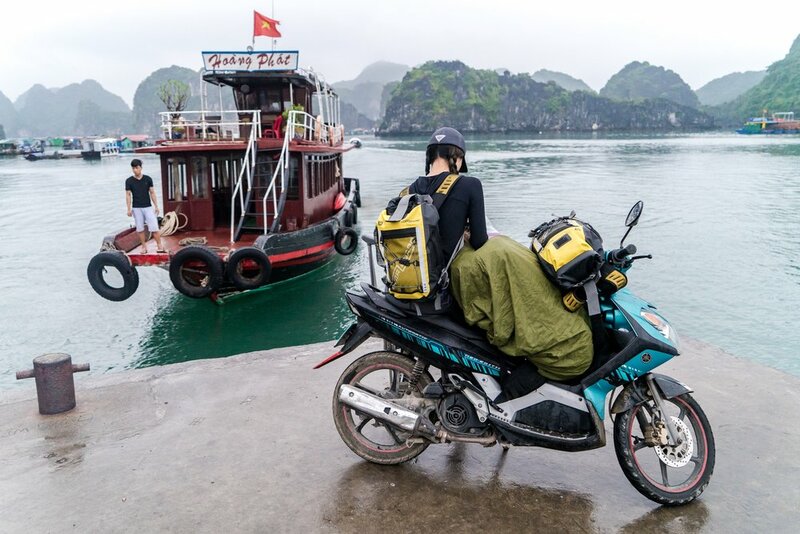 With our gear, we climbed aboard our trusty motorbike rental and rode 1.5 km through the town to Ben Beo Harbor, where we were to meet our guide, Matthias, from Asia Outdoors. At about 6:30 am, a German nomad with big eyes and curly brown hair tied into a bun strolled onto the harbor with three lifejackets and a backpack. He introduced himself as our guide and informed us our boat driver was on his way. Our boat driver, Chu Bien, a local who grew up on the bay met us with his basket shaped boat at the edge of the concrete steps paralleling the jade-colored waters. He had kind eyes, a gap in his teeth, and the most genuine smile. His wife handed him his lunch in a plastic bag, bread and beer. As we climbed aboard and the four of us set off towards the limestone karsts, a sense of serenity washed over me. There was something peaceful about being on a small wooden boat with good company completely surrounded by ocean water, maybe it was the healing properties of salt water and state of reflection it brings, maybe it was the excitement of getting to spend a day making new friends in a new place, whatever it was, I felt at ease. We made our way west of Cat Ba Island, through the floating village of Cai Beo where around 300 homes depend on fishing and seafood farming for income. Earlier in the morning at the harbor, we watched kids from these villages get dropped off by water boat taxis and picked up by motorbike taxis for their daily commute to school. Kids who live further away usually do not go to school since the commute is often too far and expensive for the family. Most of the homes in the floating village had dogs who barked as we rode past in our boats. Matthias told us the fishermen used the dogs to scare the birds away to keep them from stealing their catches. We glided across the water for about 25 minutes before arriving at our first crag, Three Brothers. Due to the surrounding ocean water being densely populated in limestone karsts sticking out of the water like a dragon's back, the water was mostly calm and glassy, perfect conditions for paddling. We took out our packrafts and inflated them on the boat with our lightweight inflation bag. Although it is very possible to launch your own packraft from the harbor and paddle your own way to the crags, I highly recommend against doing this unless you are a local certified guide or expert deep water solo-er. First reason being, the accessibility of some of the climbs is very dependent on the water levels, which is protected information for safety reasons. Second, the depth of the water varies which makes some of the climbs unsafe to fall or jump from. Third, some of the crags are registered and protected, making it a requirement to have a license to climb. Finally, the tide levels change from hour to hour making it difficult to know when it is absolutely safe to climb unless you have the exact levels of the tides for every hour of the day. For these reasons, on top of being new to deep water soloing, we decided to go with a climbing certified guide from the only licensed climbing agency on the island, Asia Outdoors. The process of getting on the wall posed challenges unlike any climbing we've done before. Even though we managed to start one climb from the packraft, the tide was too low to make the task easy. Most of the climbs started from the stern of the boat. Chu Bien would float the stern underneath the start of a climb and pull the boat away backwards from the wall as soon as the climber got up to avoid falling onto the hard wood. During higher tides and with some paddling skills, starting the climbs from the packraft would be very workable. Pictured above, Juuso climbs a line on Three Brothers as Matthias stands watch and guides him through the holds from the Castaway packraft. Once the climber reaches the end of the line, he has one option: jump. The boys took turns deep water soloing and packrafting / spotting as I snapped photos with my camera from the boat, resenting my injured ankle. Eventually, the boys tired their arms out, and it was time to go on to the next adventure: packrafting hidden lagoons. Launching ourselves from the boat was fairly easy as all we had to do was step into the raft and sit down. Juuso handed me the paddle after I boarded the Nirvana Self-Bailer packraft, then lowered himself behind me onto the raft. The gateway to our first lagoon was through an archway underneath a rock wall. Pictured below Matthias sits in the lagoon while we made our way slowly through the arch, soaking in every new sight gradually opening up in front of our eyes. I've often found with these type of trips where you're seeing something for the first time, that the journey to discovering these hidden gems are what makes reaching the destination so wonderful and rewarding. So for the sake of adventure, I will not share with you the exact location of these lagoons, but tell you that Bova floating restaurant and homestay is a good area to start your search. The second lagoon was around the bend from a temple located on an uninhabited beach. Paddling towards the entrance almost seemed like we were approaching a dead end, but the closer we got, the further the passage went. After a few snakey turns we ended at my personal favorite lagoon, where the tip of the surrounding rocks were shaped like you could separate the layers and make arrows for giants. The plant life was lush, the birds chirping, the vines chilling, and the energy zen. We contemplated rigging a hammock there and spending the day. In just the short amount of time spent in the lagoon, we witnessed just how fast the tide changes in Lan Ha Bay. Rocks which were protruding out of the water on our way in were almost completely submerged on our way out. The accessibility of some of these lagoons and beaches along the bay largely depend on the tide levels. Our final lagoon was also through an archway and was a bit smaller in size and shallower depth than the others so we made our way by foot - or in my case, by shoulders. The still, shallow waters made for a perfect nesting site for mosquitos who welcomed us by sucking our blood in 34 places on each of our bodies. After we had our fun in the lagoons we climbed aboard our basket boat with Chu Bien who was waiting 30 meters away. We secured one raft to the top of the make-shift boat roof (made out of bamboo and tarp) and placed the other packraft on the stern of the boat (which made for the perfect bed) as we made our way back to the harbor. But not before stopping for one last climbing session and a 40 footer to end the day. Although I didn't get to participate in any of the climbing, Juuso expressed this was hands down one of his favorite trips we did while we were in Vietnam. "There was a sense of freedom I felt not being tied into a rope and then having the ability to jump into the water after the climbs." And we couldn't have been introduced to the sport by better people. We highly recommend booking a guide with Asia Outdoors if you'd like to try this in Cat Ba. Also, paddling to the lagoons wouldn't have been possible without our Kokopelli Packrafts and with each raft rolling up to the size of a tent, it's easy to travel with. Legend has it that centuries ago the bodies of three murdered women from the Tran Dynasty washed up on three different beaches of the island. Local fishermen found the bodies and the residents built a temple for each one, eventually giving the island its name. ‘Cac’ meaning all and ‘ba’ meaning woman. Cat Ba is the largest island of the Cat Ba Archipelago, a UNESCO Man and Biosphere Reserve Area located in the south-eastern edge of Ha Long Bay. At the heart of the island lies the Cat Ba National Park which covers approximately one-third of the islands land mass. The National Park was established in 1986 and has been a popular tourist destination since the mid-90's. Cat Ba town, the current tourist hub of the island, is found on the southern coast. Initially mostly visited by wealthy Chinese and Vietnamese tourists, Cat Ba is today considered the adventure capital of Vietnam. The constant flow of backpackers and tourists has led to higher demands in development and as of May 2017, there is a massive project underway, aiming to transform the southern coast of the island into an enormous compound of villas, resorts, hotels, and marinas, even including a sports-center. Human development and poaching on the island have already led to the near extinction of the gold-headed langur, a species native only to Vietnam. Although the langur population and habitats are now monitored by a German-based NGO in partnership with local authorities, illegal poaching, overfishing, and water pollution in Ha Long Bay will continue to threaten the ecological well being of the island as tourism increases. Reference: Cat Ba Island. Wikipedia. 14 December 2017. There are over 120 sport climbing routes and more than 230 DWS lines on Cat Ba Island and the surrounding area. Most of these routes are located within UNESCO World Heritage Boundaries, the National Park, privately owned land, or military areas. Climbing as a sport is still fairly new in Vietnam and the officials are wary of its potential dangers for both the land and the practitioners. For safety and preservation purposes, almost all climbing around Cat Ba Island requires an access pass. There are a number of tour operators at your disposal but the only licensed climbing agency on the island is Asia Outdoors. Asia Outdoors have invested immense efforts in acquiring the appropriate licenses from Vietnamese authorities. Not only do they pay rent to the owners of private lands to gain access to the crags but they also maintain the climbing routes and trails, cover the costs of climbing bolts and pretty much anything else that ultimately enables us to enjoy the climbing in the area. Consider the fee of an access pass a contribution towards a sustainable future for the climbing on Cat Ba. Weather plays an important role on climbing in Vietnam. October to June is generally the best time for sport climbing as rain decreases and the temperatures cool. September, October, and November are usually the best months for deep water soloing due to the cooler weather, warmer water, and higher tides. Reference: Ha Long Bay Climbing Guide Book. Asia Outdoors. 2016. By Hired Transport: We’ve found that using public transportation usually ends up costing more than just taking a direct route with a travel agency. The quality of service, price, and amount of vehicle transfers also differentiates between travel agencies. Daiichi Travel was our favorite because the route was direct using one bus the entire route (hopping off and back on during the ferry) and it will pick you up and drop you off at your hotel and/or city center. You can book with them online via their website or go to one of their office locations in Hanoi or Cat Ba Island if you're booking a return ticket. At the time of writing this, the cost of a one-way ticket from Cat Ba to Hanoi booked directly in their Cat Ba office was 150,000 vnd ($6.58). By Motorbike: In order to get to Cat Ba Island, you will need to take a ferry with your bike. There are two highways that will take you to the ferry port but one of them is restricted to cars, buses, and larger vehicles only. The highway you want to take when traveling by motorbike is AH 14, also known to the locals as the old highway. Take AH 14 to this bridge (20.803763,106.7759274) where you will cross and arrive at Ben Pha Got ferry port (20.8041316,106.8926021) and drive onto the ferry with your bike, which will transfer you to Cat Ba Island. There are many resources for finding accommodation on the island. During our stay, we tried out Enjoy Hostel which had friendly staff, an elevator, motorbike parking, spacious rooms, but hard beds and a breakfast which could use a bit of TLC. We moved over to Sea Dragon Hotel for the rest of our stay which was cheaper than Enjoy and had an elevator and a decent breakfast, but small rooms. Neither of these accommodations blew our expectations out of the water but were centrally located and had cheap options for private rooms.